From all of us at Scrap Shotz,we wish you all a very Merry Christmas. Here is an easy Christmas tag for a hostess gift! 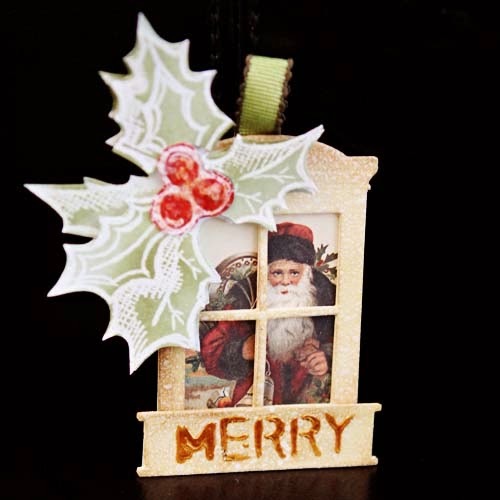 To make the tag, cut 4 window die cuts with the Taylored Expressions window die. This tag can be made with any window die and there is a fine selection in the store. Adhere the window die cuts to one another to strength the cardstock but also to add depth to the window. At this point, I applied Tim Holtz distress inks and a quick spray of Tsukineko irRESISTible spray to the window die cut but if you are in a hurry, you can bypass this step. Then back the window with a piece of pattern paper; add a ribbon and accent accordingly. What is fantastic about this tag is that it can easily be adapted to any occasion by changing the pattern paper beneath the window. For a birthday, add a fun sweet print. The sentiment is handwritten with the Tsukineko Pico Embellisher. 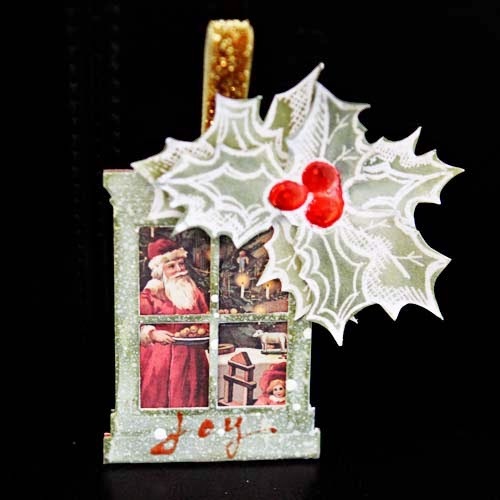 The sentiment on this tag is written with the Tsukineko Pico Embellisher through the Tim Holtz Layering Stencil of phrases. 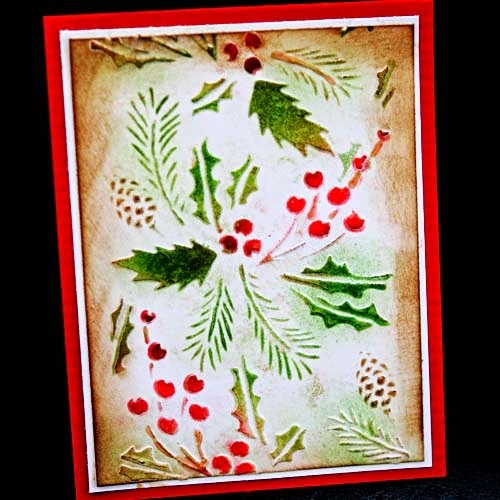 Want to create a beautiful and unique card to adorn your Christmas present? Consider the card below. 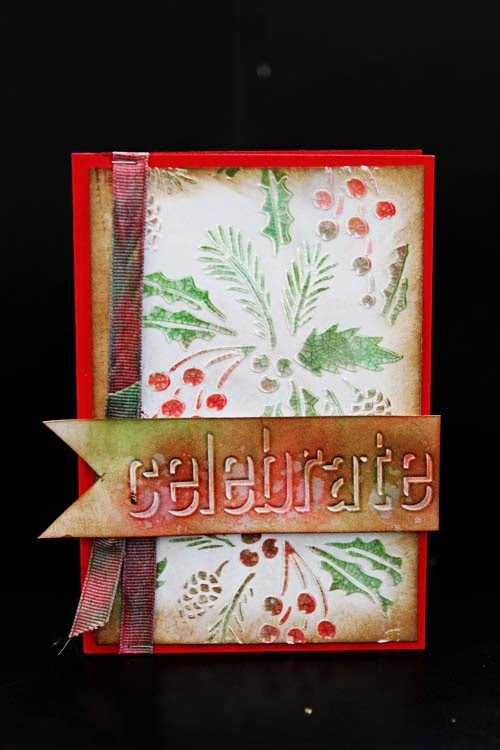 For the background, I used the Tim Holtz Layering Stencil - Festive along with the Wendy Vecchi crackle paste. Apply the crackle paste through the stencil - allow to dry thoroughly. Yes, you can speed up the drying process with your heat gun! As the paste begins to dry, you will see the gorgeous cracks form. Once the paste is dry, you can apply Tim Holtz distress inks with an applicator directly onto the crackle paste or you can reposition the stencil and apply the distress inks through the stencil. I like both looks. For those tighter, smaller areas, apply the distress inks using the Tsukineko Fantastix colouring tool. I found with a heavier application of ink, the crackles became more pronounced. Personally I find the crackle look gorgeous and unique. Once I was happy colouring the paste, I added colour to the edges of the stencilled card front. For the sentiment, I used the Tim Holtz Shadow Press embossing folders. After I embossed the paper, I applied various distress inks to the front and around the embossing. Then I adhered it to the card front. To create a colour coordinated ribbon, stamp the colours of the distress inks you used. Spray with Rangers Perfect Pearls onto the distress inks. Dip your ribbon into the pearlized ink water and let the ribbon absorb the colours. Let ribbon dry and tie onto the card. Hope to see your cards too!